Recorded in many forms as shown below this interesting surname is English but of French origins, of which it seems to have at least two possible sources. Firstly, it may be derived from the Norman personal name "Ivo", a short form of any of the various Germanic compound names with a first element "iv" (Old Norse "yr", the plural of "ifar") yew, bow a weapon generally made from the supple wood of the yew tree. This was a popular name in Normandy and Brittany, and was introduced into England at the time of the Conquest of 1066, perhaps reinforcing the Olde English pre 7th Century "Ifa, Iva". The second source is locational from either Ivoy or Evieux both places in Normandy. 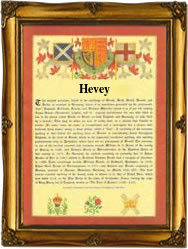 The modern surname can be found recorded as Ivey, Ivy and Ivie, as well as the dilalectals Heavey, Hevey and Hivey. Early examples of recordings include the christening in Cornwall of James Ivey, on March 28th 1617 at Perranzabuloe, and that of Mary Heavy at St Andrews Holborn, in the city of London, on August 25th 1717. The first recorded spelling of the family name is shown to be that of Geoffrey de Iuoi, de Ioue, which was dated 1161 - 1162, in the "Pipe Rolls of Oxfordshire", during the reign of King Henry 11, known as "The Builder of Churches", 1154 - 1189. Surnames became necessary when governments introduced personal taxation. In England this was known as Poll Tax. Throughout the centuries, surnames in every country have continued to "develop" often leading to astonishing variants of the original spelling.